CAMINA EL AUTOR: Juancho's travels in Peru: Casa Cervecera "De Tomás"
In the first week of August, on one of my last days in Lima, Nico, Diego and I went to visit a locale that I had been curious to visit: Restaurant Cerveceria De Tomas. 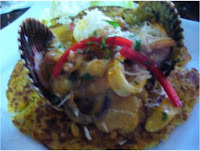 Located on Lima's Avenida Rosa Toro, home of many cevicherias, it's fare -not unexpectedely- tended toward seafood. 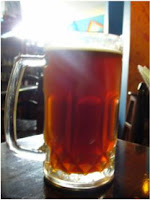 However, the reason for the visit was that De Tomas is Lima's only brewpub. On the day we went, the place could not have been deader. For most our meal we were the only diners, and only at the end did a nother table fill up. This may have been in part due to the day of the week -a Tuesday- and the time of the year -mid-Winter- as ceviche is generally regarded as a revitalizer after a hard night and as Summertime fare. The fare, it must be said, was quite good. Not great, mind you, but solidly done and in that realm De Tomás has no need to envy any of its neighbors I'm sure. I, of course, was there for the beer. All of De Tomas offerings seem to be ales. Upon that base, they build their selection of beers by tweaking the malts, and most often, it seems, by use of additives. The server did share that they use a mixture of whole-grain malts and malt extracts depending on the recipe and on availability of particular ingredients. He would not say what hops were used, saying that that was known "only by the technician in charge of making the beer." From what I can recall, their basic beer was a "Pilsner", although it lacked the body and hop character of any Pilsner I have tasted and did not even compare favourably with Peru's standard Pilsner- and Bavarian-style commercial lagers. If anything, it tasted like a light beer. The next one on the list, and the second we tried, was one made with the addition of algarrobina, a syrup made from the seed pods of the algarrobo or huarango tree (Prosopis pallida), which is sometimes referred to in English as "American carob" and in Hawaii, where it has been introduced from South America, as "Kiawe." Algarrobina syrup is widely used in Peruvian cooking and is a common flavoring in desserts and cocktails. The beer made with it was actually quite tasty and balanced. The algarrobina added a nice undertone to the beer but did not dominate, and seems to have lent some body to the beer as well. The third beer tasted was their Red beer. This one was brewed with darker malts and the addition of honey. It also was an improvement over the Pilsner and the honey's influence was noticeable. It's head was also denser and more longlasting than that of the other two. Other offerings included a dark beer (also brewed with honey), a lime-flavored beer, and a mint-flavored beer, as well a "Premium" beer which included "special malts, honey, and fruit flavors" but which was sadly unavailable at that time. 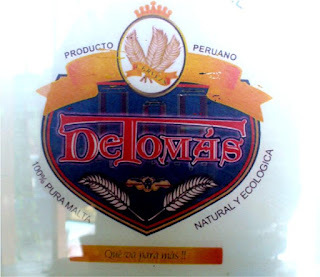 Considering that Peru's beer culture is dominated by Bavarian- and Pilsner-style lagers and the complete absence, at least in Lima, a metropolis of nearly 9 million souls, of a single other brewpub, one has to recognize that De Tomás is doing well by holding its own ground in the face of some stiff competition. 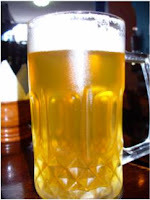 I suspect that the lightness of the beers and low hop character are probably, more than anything, a measure of the extent to which the availability and prices of malt and hops in Peru are impacted by the sheer size and reach of Backus & Johnston, which holds near-monopoly on beer and brewing in the country. Backus' monolithic status has been recently challenged by the Brazilian group InBev, and by the Ayacuchano Añaño family with their Aje Group breweries. 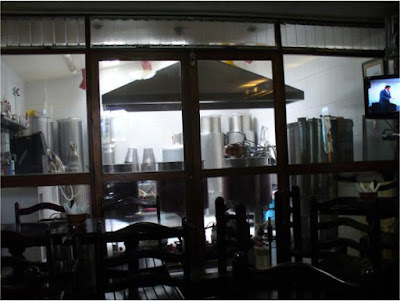 Hopefully, others -maybe one of the dozen or so small, independent breweries said to be operant in Lima- will follow upon Mr. De Tomás footsteps and open up more brewpubs. For such a beer-drinking nation, it would seem a natural step, and in any case, Mr De Tomás seems committed to making it happen as he offers yearly courses on brewing at the pub. Restaurante y Casa Cervecera "De Tomas"
Memory Lane ... or Chair?